Garden at Hotel Kerio View, Iten, Kenya. 7 October 2010. 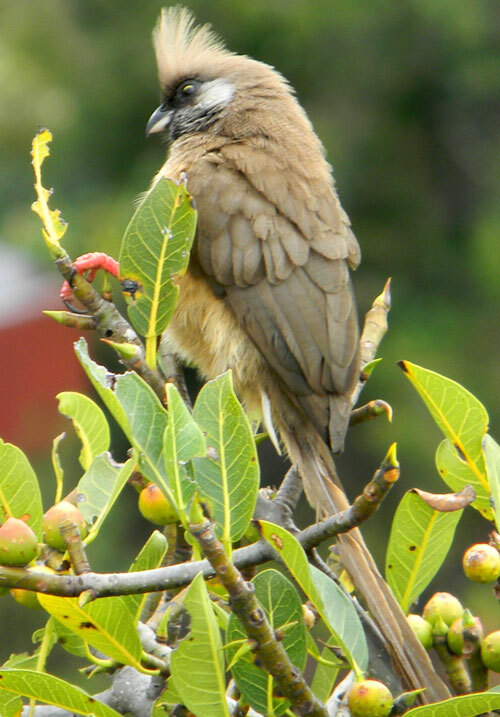 Naturalists on their first visit to Kenya from temperate areas are typically overjoyed at their first glimpse of this active and playful-seeming bird. The very long tail and the alert crest make them fun to watch. Soon it's found that they are one of the more common birds especially around gardens and hotel grounds. Farmers find that they can be quite a nuisance because of their diet of fruits and even vegetables. The designation as ‘speckled’ derives from the small black spots on the white cheek patch - in this photo the speckles are hard to see and are not always visible on birds seen at a distance.